You may or may not know about active speaker systems, but the theory isn’t all that new, and it’s a very efficient means of audio playback. The idea is instead of amplifying the full frequency range, and then letting a passive crossover split the frequencies between the bass, mid and treble ranges, an electronic active crossover is used, splitting the frequencies, before their amplified. The end result is instead of, say a 100 watt amplifier powering the entire frequency range, multiple smaller amplifiers handle bass mid and treble. So the power the speaker receives is actually more pronounced than if a single bigger power amplifier was used. Crossing over the frequencies via electronics also provides the ability to insert digital signal correction, in the path, compensating for room deficiencies. 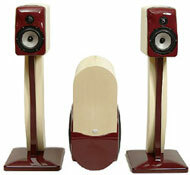 NHT’s (Now Hear This) new Xd speaker system uses such an electronic crossover to achieve their impressive sound. The speakers themselves are very small and stylish, making them suitable for rooms with less than ideal space for large freestanding speakers.